The first time I visited Bulgaria, I had no idea what to expect. The second time I visited Bulgaria, I knew a bit more about what to expect. And, the thing I was most excited about? The Bulgarian Food! Trust me when I say that I’ve had some of my finest meals in this country. I think it might be from the combination of natural, organic, non-GMO produce coupled with slow, home-cooked meals. Whatever the combination, it works! From the welcome bread served with salt to the honeys and jams made in the backyards of the villages to the grass-fed, wild-roaming sheep and pigs, the flavors are unbeatable. It’s difficult to pick my favorite food, but if I had to, I’d say it would be a tie between the yogurts and cheeses. I honestly couldn’t pick just one of them. Yogurt here ranges from the liquid, milky-looking drink that is sour, but filling, to the thickest, creamiest yogurt with an almost ice-cream-like consistency, topped with blueberries and honey that tastes of the local flowers. Cheeses top everything from salads (shopska salad being my favorite: a simple medley of tomatoes, cucumbers, and crumbled white cheese) to baked dishes, including a delicious combination of pork and onions with spices cooked in a clay pot, topped with an egg and covered with melted cheese. 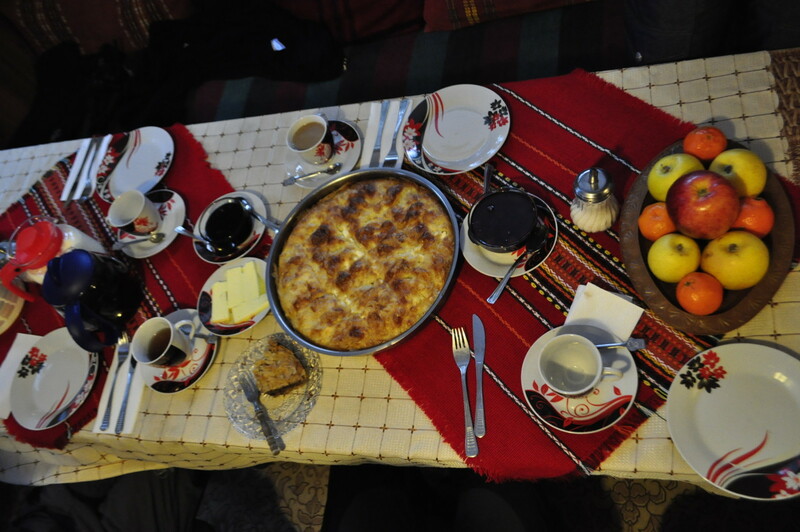 The Bulgarian food is hearty and simple…and meals can last a long time. Meals start out with a first course of salad and rakia (the local moonshine, made usually of grapes, but other times made from pears or even roses). Next up would be a fine course of meat and seasonal dishes, including stews baked inside of a pumpkins, many slaws, and braised root vegetables. In summer time there is an abundance of fresh vegetables and fruit on the table. Everything from carrots to cauliflower is pickled and served throughout the winter months. For dessert there is always some combination of dough and honey: whether it’s an apple-filled bunitsa, covered in cinnamon, or a baklava-like layered dish with honey and walnuts, you will not be disappointed! Even the drinks are a delicious homemade concoction of local herbs and flowers served over ice in summer, or heated into a tea for winter. And, what’s best about a meal in Bulgaria? Getting to eat it with the locals, some of the friendliest, funniest, and interesting people I have met in all my travels.